The three main focuses in my life are my wife, the study of art, and discovering new music. Fourth place would have to be reading; non-fiction primarily. 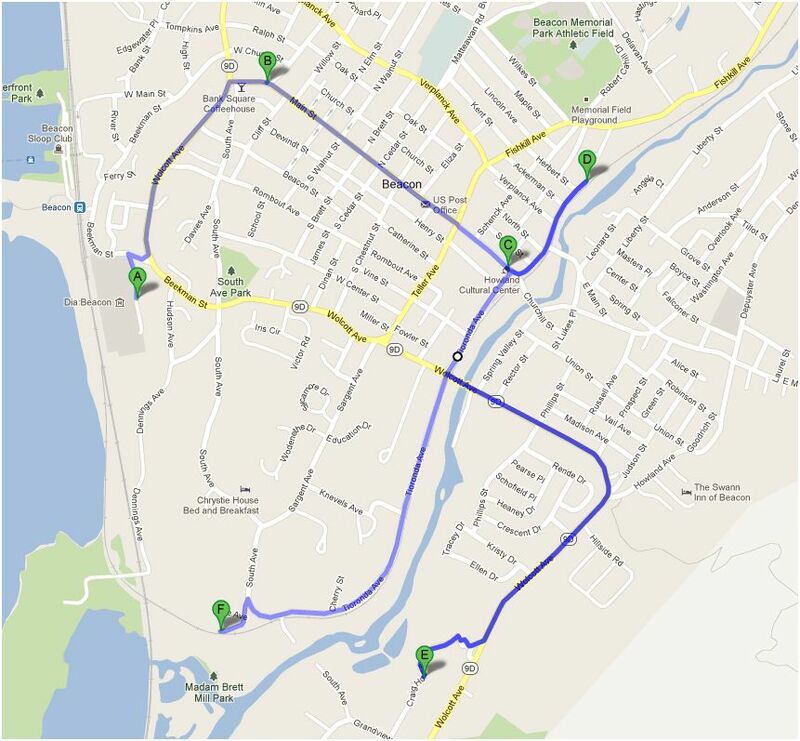 Fifth may go to running, but it’s more likely a distant seventh behind traveling and visiting with friends. For as much time and energy and money that the sport has consumed of me, it remains a love-hate relationship. 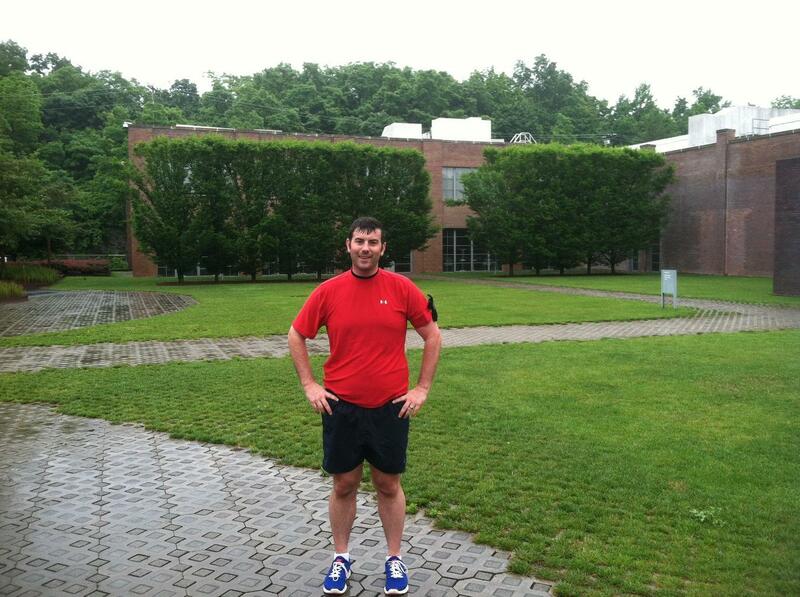 Having just moved to Beacon, NY last month, I am hoping to entwine that which I most care about with a fairly rigorous run through the city. Welcome to my multi-tasking life in Dutchess County. My wife is joining me on this trek and I’ll be giving you a crash course in the art works and history that is easily found along the way in Beacon. Without further ado, get yourself on the west side and start running. I want to thank my wife, Stephanie, for getting out here this morning and running with me. Two weeks ago, she completed her third marathon and I know it wasn’t easy to hit these hills around Beacon. 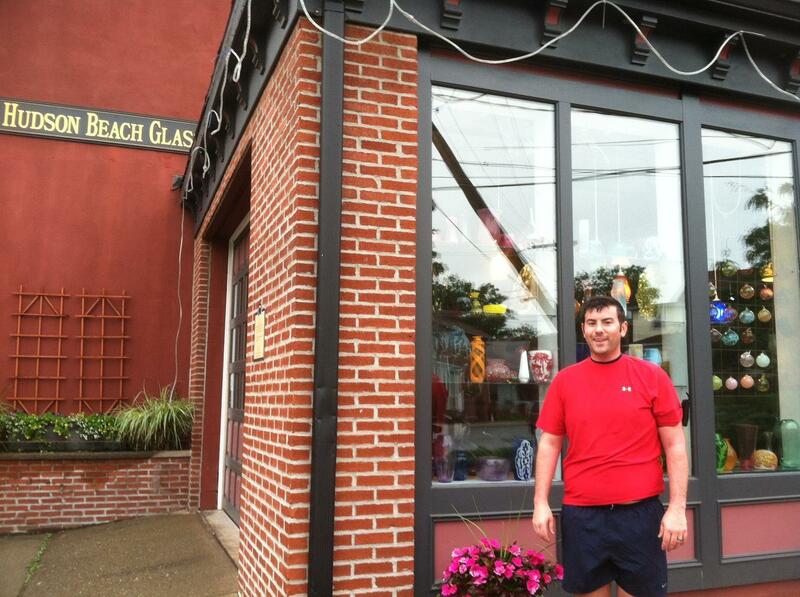 Heading east on Main Street, we pass by Hudson Beach Glass. The open view of the glass blowers gives you an idea of the skill that the craftsmen and craftswomen possess. It also can get pretty hot inside their showroon which is fitting since the building is an old firehouse. The pieces are astounding. Hudson Beach has been doing this for over 20 years. There is also an art gallery on the second floor. I want to thank the Mikhalevskys, Nicholas and Alana, who first introduced me to these wonderful pieces. Just a little further up Main and we pass the Howland Cultural Center on the right, the former library commissioned by Civil War general and shipping magnate, Joseph Howland and 10 other prominent members of the community. Designed by Richard Morris Hunt (more famous for designing the base of the Statue of Liberty and two Vanderbilt mansions) and built in 1872, the library was initially only available to subscribers. Its architecture is Norwegian in style and is made of the finest Delaware slate, Georgian pine, granite from nearby Breakneck Ridge and the red and black brick is also locally sourced from Croton, NY. I want to thank my parents who instilled in me a love of reading at an early age. 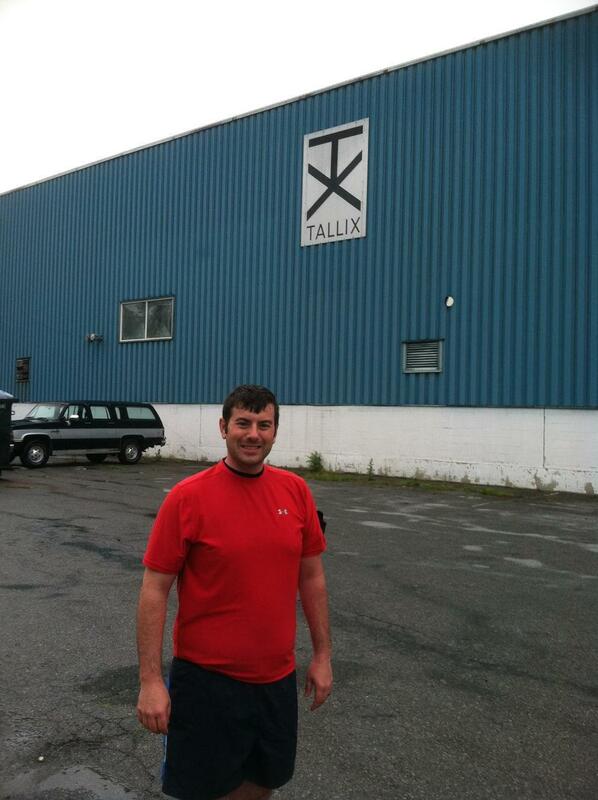 Next on the sight seeing tour is Tallix Fine Art Foundry. The former site of the Green Fuel Economizer Company, Tallix is where a couple of very talented American artists cast Leonardo da Vinci’s unfinished plans for the largest equestrian statue in the world from 1482. Da Vinci’s was never completed, I suspect because it was so ambitious. 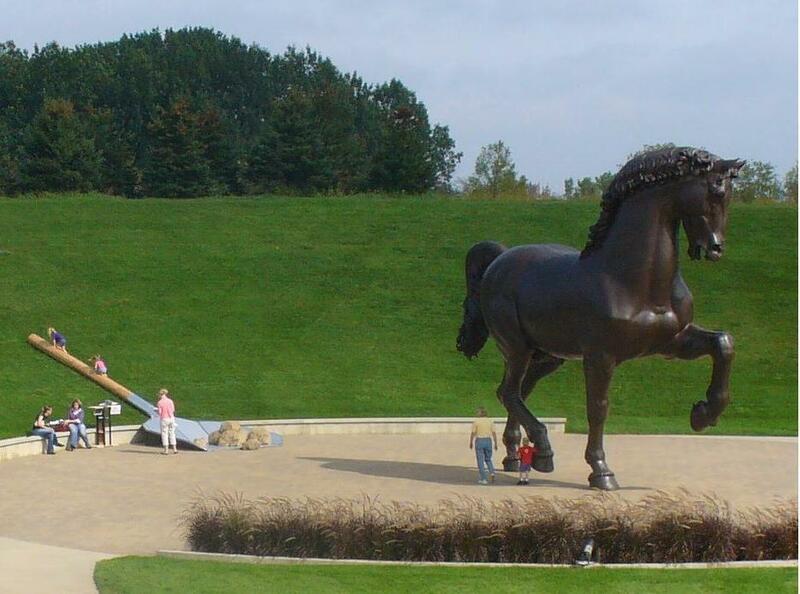 These guys made two, one of which is in Milan (Il Cavallo) and one that can be found in Grand Rapids, Michigan at the Meijer Gardens and Sculpture Park (seen below). They are 24 feet high! The foundry produces amazing pieces for a number of artists and there are plans to add their own sculpture garden on the property. 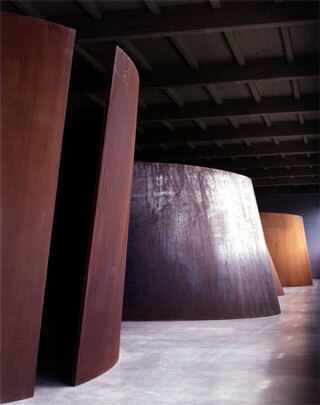 I want to thank Dr. McColl at Washington College who taught me how to appreciate art and the study of art history. Knowing what I’m looking at makes it much easier to enjoy places like this. Heading north, we cross over Fishkill Creek and head out towards Mt. Beacon. The top is so named for Revolutionary soldiers signal fires that served West Point and the Hudson Valley. In 1902, a funicular took guests up the steepest incline in America to a casino, hotel and restaurant where you could sip cocktails and gaze out on 75 mile views of the Hudson Valley. You can see New York City to the south if the weather is clear. I’m not headed there, but there is a clearly marked trail up, though it’s rough in spots for running. We are headed along Wolcott Avenue to the Tioronda estate. 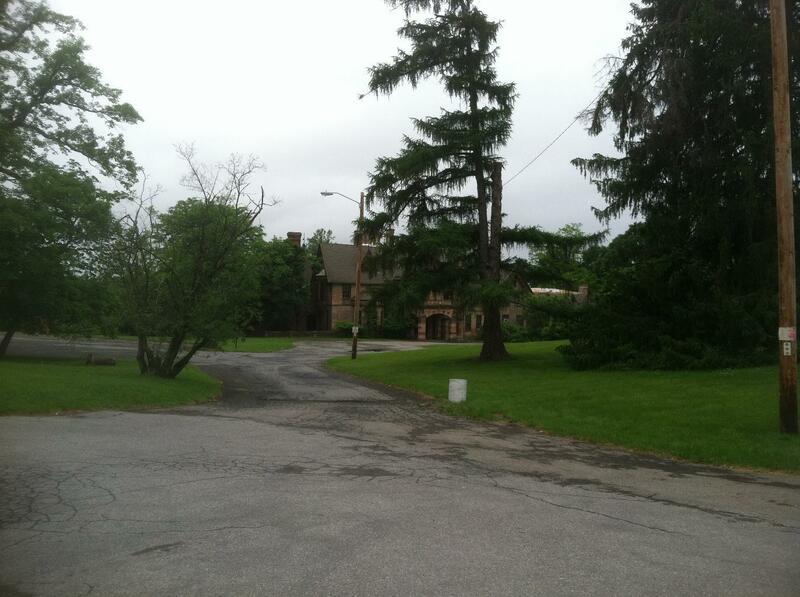 Tioronda was the showplace home of Joseph Howland, who was also an early advocate of mental health. 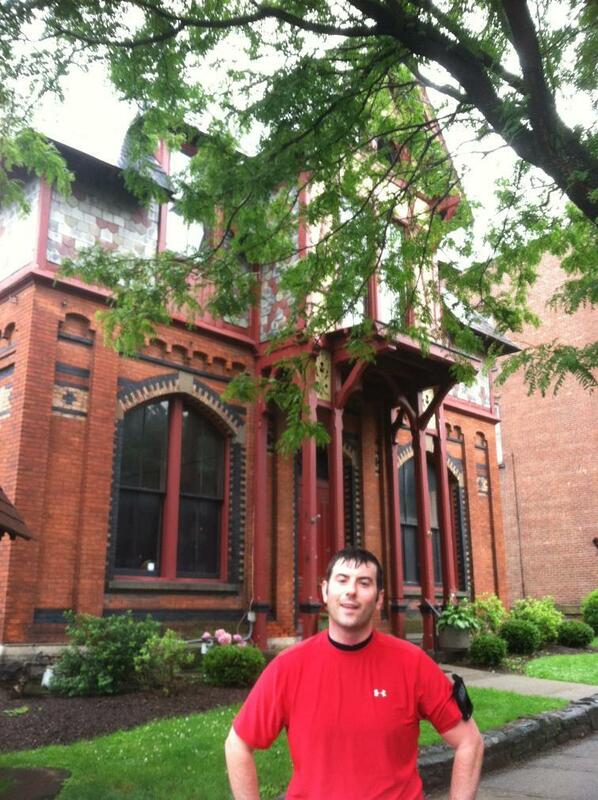 It was renamed Craig House Sanitarium for the Insane and operated for 80 years. Famous guests of the facility through the years included Zelda Fitzgerald, Marilyn Monroe and Truman Capote. The house and psychiatric wing is abandoned and it can feel a little creepy. The signs say ‘No Trespassing,’ so I didn’t get very close. I want to thank my brother and sister, without whom, I wouldn’t have found my own way as easily. Let’s get back to the creek. Heading south and downhill on Tioronda Avenue, we’ll cross underneath the railroad trestle and into Madam Brett Park. Cathryana Rombout Brett was the first female European settler in the region. She and her husband built the gristmill somewhere down here on the creek bank, trading with Native Americans and Dutch settlers from New Amsterdam. 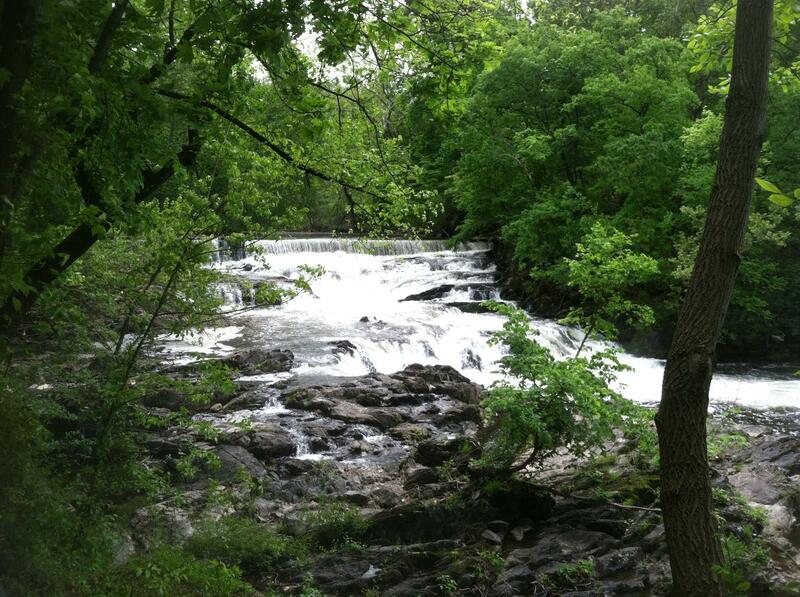 Fishkill Creek has some gorgeous waterfalls and this is one of them. Farther south, you can see Schunnemunk Mountain from the marsh overlook, but eventually the trail disintegrates into rubble and then finally grass right before you hit the Amtrak lines. I want to thank Steve Good for giving me the opportunity to write this, and also for continually supporting running, competition, and good works. I’m donating to the Phi Delta Theta Foundation in recognition of our friendship and brotherhood. 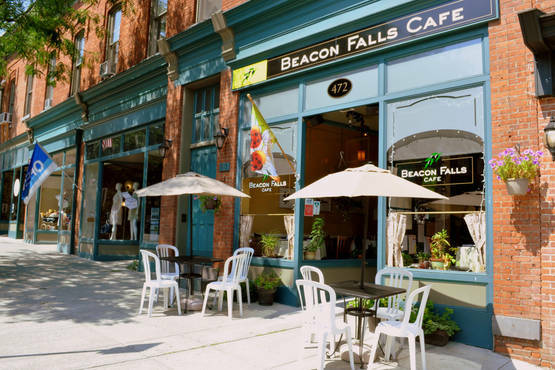 If you’re looking for something to eat, Beacon Falls Cafe (472 Main Street) has some great burgers and reubens; there are tables outside with a great view of Mount Beacon! 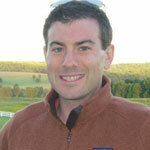 Brendan Cunningham is an Annapolis, Maryland native, but a recent expat to the State of New York. 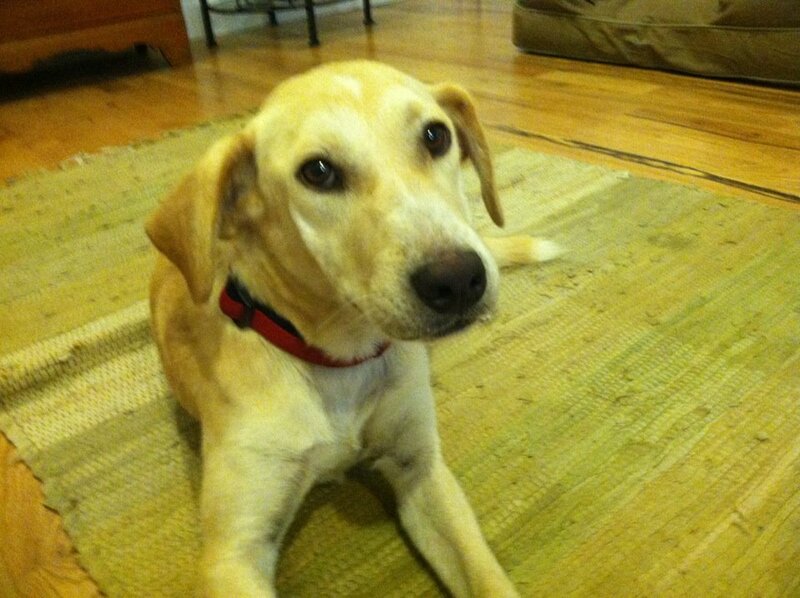 He spends his time independently researching and walking his dog, Quinn.